CCM: humanitarian or disarmament treaty? During a hiking trip last week I began reading David Edgerton's thought provoking book The Shock of the Old: Technology and Global History Since 1900. Edgerton is a technology historian at London's Imperial College. He argues that too many analyses of technological development over-emphasize innovation - and with it connotations of progress in technology from 'low' to high' - and miss the point that it's use of technology that's more salient. If we think of the important technological developments over the last century from a innovation perspective, Edgerton says, we tend to get a list of boys' toys, for instance, the car, the airplane, the rocket, atomic technology, the digital PC and the internet. But if we look at these from a use perspective we get a different picture. In poorer parts of the world, few technologies on the list above would feature as pivotal. Instead, technologies like asbestos-concrete (still in very widespread use, despite being phased out in rich countries because of health concerns) and corrugated iron feature prominently in most places you go. And Edgerton offers some fascinating examples of how technological development isn't necessarily linear. Recently the Concorde supersonic airliner, designed and built in the 1960s, was taken out of service leaving only slower, subsonic alternatives. Meanwhile, in Ghana there are huge shanty town magazines in which thousands of people live and work to continually repair and maintain ancient Peugeot taxis, Bedford vans and buses using the most low-tech of available tools and materials. Many vehicles in these environments have reached a state of equilibrium, in which - necessity truly being the mother of invention - they are perpetually maintained, although in very different ways from their original manufacturers' specifications and intentions. Indeed, newer vehicles are often spurned, since the complexity of modern automobiles and dependence on sophisticated components and electronics make them impossible to maintain in such environments. Meanwhile, parts of the poor world have vaulted over technologies that in richer societies are still familiar. Telephone land lines are too expensive to install in shanty towns in many parts of Africa: mobile infrastructure is cheaper and easier to build and maintain. The locals who can afford it use mobile phones. In Kenya a few years ago, I saw people in the country-side going to vendors by the side of the road who for a small sum would recharge their mobile phone from a contraption based on a car battery, since there was no mains electricity supply. Mixing the old with the new like this are what Edgerton describes as 'creole technologies'. "The post-Second World War assault rifles, which could fire powerful bursts of lead, and not just single shots, hugely increased the firepower of small infantry formations. The cost to civilians in war zones has been enormous. With such weapons it was easy to massacre the inhabitants of a village, as US troops did in Vietnam over and over again. Conflicts between people which might have left a few dead were now likely to kill many more. Not surprisingly, th spread of automatic assault rifles to Africa in particular has become a huge source for concern." As its 61st birthday approaches, the AK-47 and its ilk are still killing. The spread of weapons like Kalashnikov are serious and destabilising enough. But like the proverbial 'grandfather's axe' (continually having parts replaced), such cheap and lethal weapons could be kept going in the field indefinitely once out there. The automatic rifle, Edgerton argues, "was the weapon that civilianised war much more so than the aeroplane or the gas chamber". Therefore, it seems that if we're serious about combating the deleterious human consequences of the use of illicit weapons, there needs to be thought beyond just curbing the illicit trade. Closer control over ammunition seems an obvious starting point. It's much more difficult and capital intensive to produce reliable ammunition than it is to keep Kalashnikovs going. And, of course, guns are just fancy clubs without bullets. This is indeed something UN groups of experts have looked at and - as such groups do - produced various reports on. But real action has been thwarted for political reasons. More needs to be done. 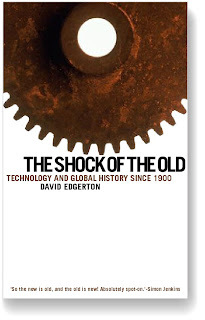 David Edgerton, The Shock of the Old: Technology and Global History Since 1900, Oxford: Oxford University Press: 2007. Christophe Carle, 'Small arms ammunition: light at the end of the barrel? ', Disarmament Forum, 2006: 1, pp. 49-54. It would seem the relevance of the simple over the complicated is not confined to conventional weapons issues - it is also alive and increasingly relevant to WMDs. Whilst there are clear connections between recent advances in 'high-science' in the biological sphere and their potential to be used as weapons (see for example www.unog.ch/bwc/science), current concerns are not confined to new technology. Indeed, the simplest forms of biological attack - those that have actually occured in the past have involved the deliberate spread of animal diseases. Such attacks require little or no technology but have the potential to cause a massive economic or social impact. This blog posting seems to hit on an important message - sometime we focus so much on the new and the shiny, we forget all about lessons from the past.